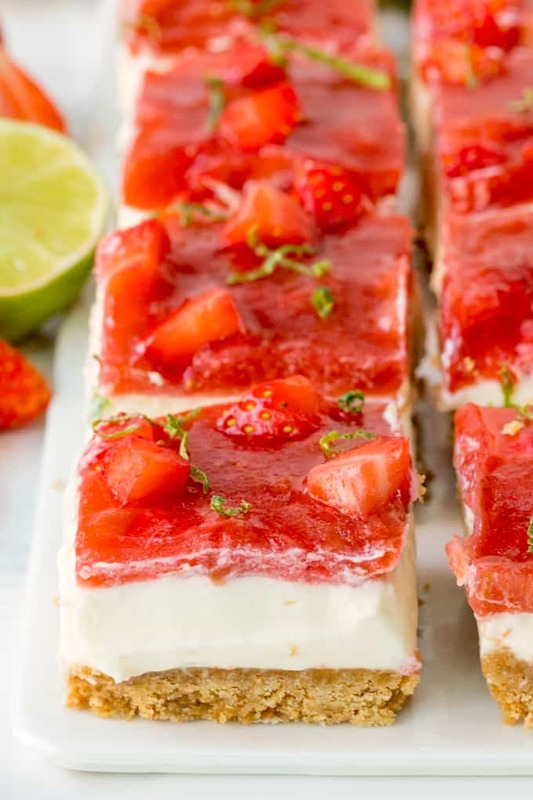 These moreish Strawberry and Rhubarb Cheesecake Bars are topped with a delicious homemade jelly topping! 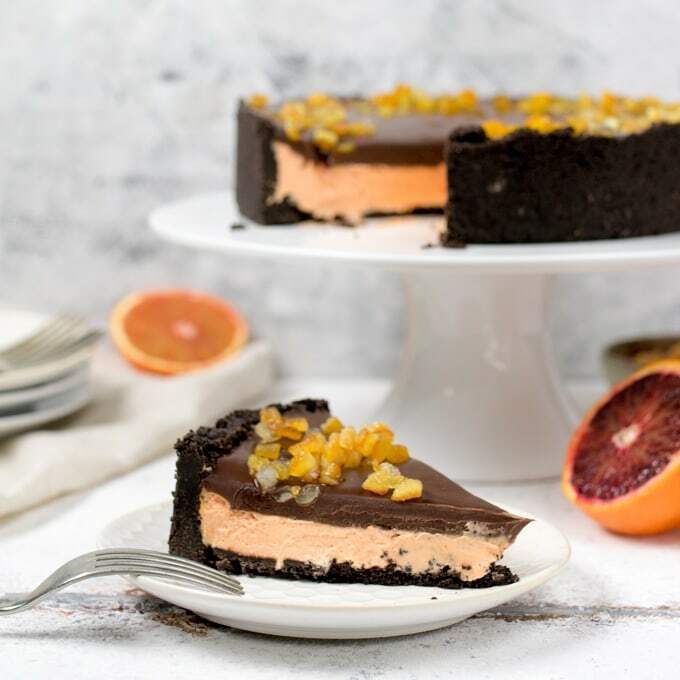 No bake cheesecake – the perfect make ahead dessert! Strawberries and rhubarb. Is there a better summer flavour combination? The sweetness of those strawberries offsets the tartness of the rhubarb – complimenting each other perfectly. I’ve cooked them up together and turned them into a jelly (or jello if you’re not from the UK!) topping for my no-bake vanilla cheesecake. 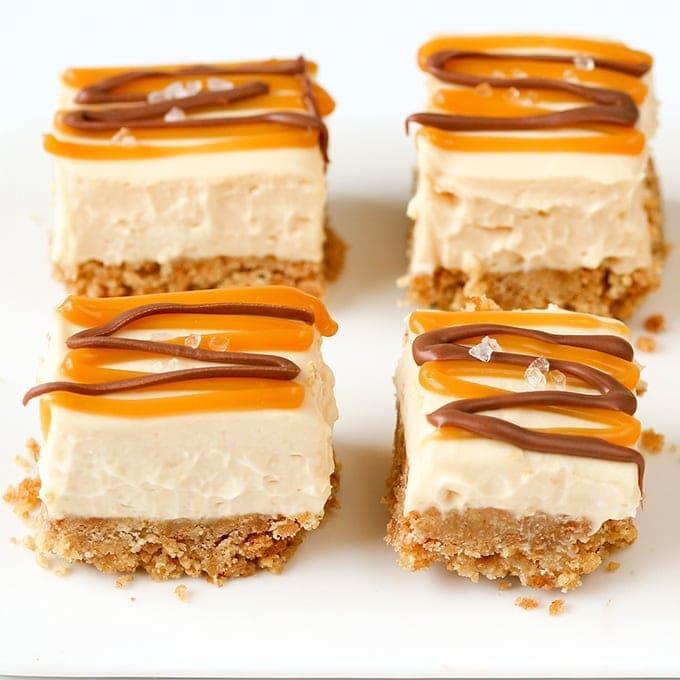 Make it ahead, and you’ve got a dessert in the fridge perfect for any Summer party or BBQ! First pulse some biscuits into crumbs and add butter, then pack into a lined baking tin. Next make the cheesecake layer by whipping cream, then whisking in cream cheese and confectioners’ sugar. Top the biscuit base with the cheesecake mixture and refrigerate. To make the topping, simmer strawberries, rhubarb, sugar, vanilla, lemon zest and juice in a pan, then stir in gelatine until dissolved. Once that’s cooled, pour it on top of the cheesecake and place in the fridge until set. Sixteen bars of no-bake summer dessert. All for me. Ok, I might let you have a slice. 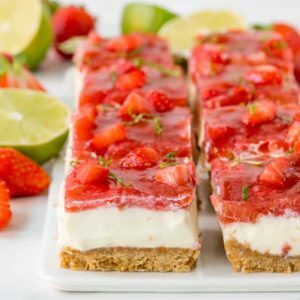 These moreish Strawberry and Rhubarb Cheesecake Bars are topped with a delicious homemade jelly topping! No baking required. 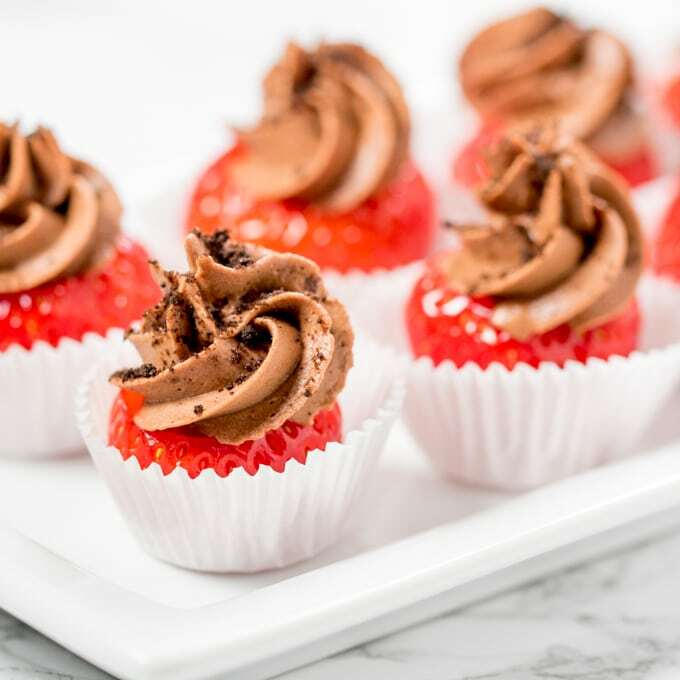 The perfect make ahead dessert! Place the strawberries, rhubarb, sugar, lemon zest, lemon juice and 1 tsp of vanilla extract into a saucepan. Bring to a gently bubble, then turn down the heat and simmer gently for 10-12 minutes until the rhubarb softens. Stir the gelatine into the strawberry and rhubarb mixture until completely dissolved, then turn off the heat and leave to cool until only slightly warm (try not to leave longer than this, as it may start to set). Next, place the biscuit crumbs into a bowl and mix in the melted butter until thoroughly combined. Spoon into a 20cm x 20cm baking dish that has been lined with clingfilm and use the back of a spoon to pack it down tightly. Place in the fridge whilst you start on the next layer. Add the cream to a large bowl and whisk with an electric whisk, until the cream holds its shape. Add the cream cheese, icing sugar, the remaining 1 tsp of vanilla extract and a pinch of salt, then whisk again until combined. Take the biscuit base out of the refrigerator and spread this layer on top. Put back in the fridge to chill until the strawberry & rhubarb mixture has cooled. Once cooled, spoon the strawberry &rhubarb mixture onto the cheesecake base, spread to ensure even coverage and place back in the fridge for 2 hours to set. When ready to serve, remove from the dish and slice into 16 pieces. Sprinkle on the lime zest and serve. Winter Spiced Pecan Caramel Cheesecake – no bake and gluten free! 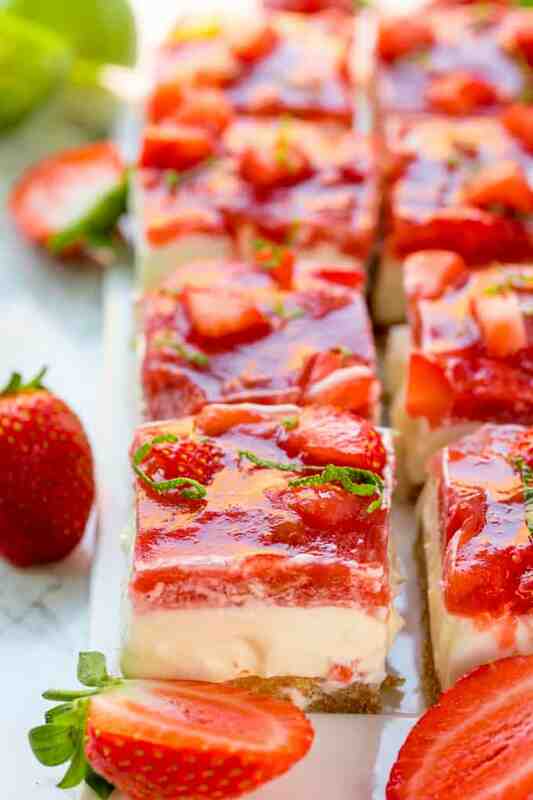 Lovely cheesecake recipe, enjoyed the strawberry and rhubarb combination. What do you mean digestive biscuits? Hi Connie, they’re a very well known biscuit in the UK. You can replace with Graham crackers if you’re in the US.